So: Tuesday morning. Both Midi and Mini Minxes decided that they couldn’t possibly sleep in their own beds and had to sleep beside me. That’s fine, especially if they’re having nightmares, are cold, frightened, feeling ill, but I don’t think it’s fair game to come bounding into my bed, stamping up my prone form and prodding me in the nose. with a yell of “Bogeys!”. Just for fun. Or having a fight with your sister about who sleeps immediately next to me. Or who has the most covers. Or kicking me in the head to make me relinquish my little 5cm sliver of mattress. Mini blinked thoughtfully, looked me right between the eyes, and announced, “Want toast, Mummy. Now. That one”, nicking a slice off my plate. Midi idly picked her nose. So the prospect of an angry me had lots of impact, then? Within 15 minutes, I was roaring: spilled milk, up-ended cereal, my entire 2 slices of toast (cut into 4 little squares each) nicked by daughters, 2 freshly-ironed uniform sets bunched up and rolled about on the sofa where the cat sits… Mini decided to raise the stakes with a tantrum. I threw one of my own. When I paused for breath, mid-rant, she suddenly changed tack with a winning smile and a lispy: “I want to say solly, Mummy – I love you!” You’ve never seen wind out of sails so quick; how can you be angry with a toddler that cute? As she came over for a cuddle and a ‘sorry’, it was just what I needed to take a breath and start the morning again. Mini knows exactly what she’s doing – she can influence and downright control my behaviour far better than I can hers! Her good influence extended all the way to the bus into the nearest town. When she decided that she didn’t want to sit in the seat. Or my lap. I tried reasoning with her. I tried distracting her (“Look! Pink shiny glittery thing over there! Wow!”). I tried bribing her. She wailed louder and struggled harder. I managed to get a seat belt around her. She turned into a noisy, squirming, shrieking Harry Houdini, with an audience of tutting old people all around us. Bless – I guess their memories were as shot as mine, except that I remember what tantruming children are like. No problems with Mini’s memory, though. 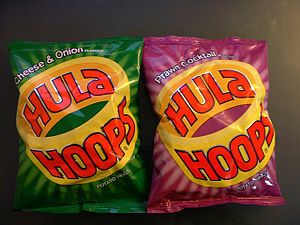 The only time I’ve ever bought her Hula Hoops as a snack was the last time we went to the garage, in summer. As we’d chatted in the car earlier about taking the car to the car-dentist for a check-up, she asked for “HooooLLLLa hooops again”. Minx! Actually, maybe that’s where I went wrong on the bus – I should have bought a packet for bribery. The rest of the day in town was wet. And cold. Bitterly, bitterly cold. Although I’d taken the sling and a ton or 7 of toys, Mini just wanted to walk. And splash in muddy puddles. Or splash me with muddy coffee (my khaki cords had a really fetching brown stain on the inside of my legs all day…). The rest of the day didn’t get much better. When I later related my tale of woe to The Boss that evening, he pole-axed me with a simple, “Why didn’t you go to the Farm Shop?” A short walk from the garage. With an indoor play area that kids really love, great food, properly child-friendly, nice coffee, farm animals to go look at. The perfect half-day out. I’m so tired I’d forgotten it existed… Meh! This entry was posted in Out and About, the things kids say and tagged children, Short-term memory, sleep deprivation, temper tantrums by GrumpyOldTrout. Bookmark the permalink.